When I am sitting on the back porch, the last thing I want is prying neighborly eyes and loud noises from the distant highway. Privacy Screens are an effective way to manage sound and eyesores; though many people prefer fences, I enjoy the natural solitude and privacy of the Nellie Stevens Holly, a Holly shrub adapted to growing as a dense shrub. Nellie Stevens Hollies are perfect for privacy screens for many reasons; it diminishes noise and eyesores, provides natural shade, and brings bright colors to the yard throughout the year. 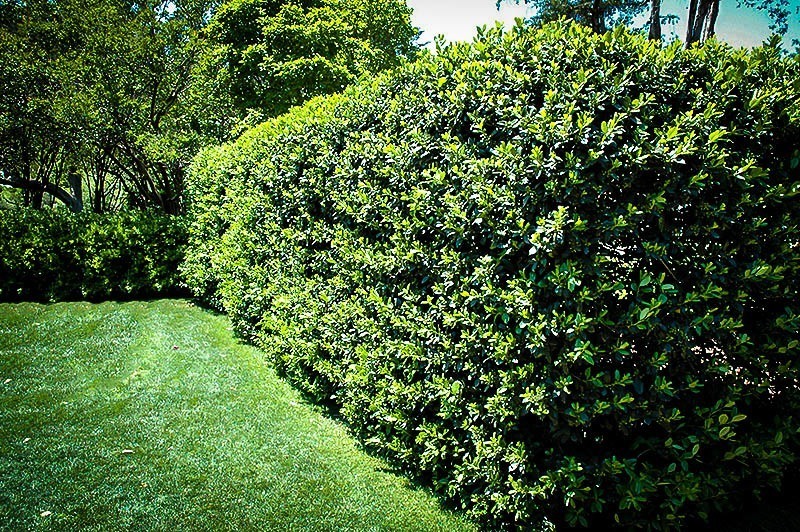 Nellies are best planted 5 to 6 feet apart in order to create the living wall of natural splendor that these shrubs bring to the backyard. Plant your Nellie Stevens Holly along a yard perimeter or property lines. I have seen Nellies used effectively as garden hedges, property markers, and even as separators within a yard. My grandfather planted the Nellie Stevens Holly along a line in the center of the backyard, to mark the end of the mowed greens and the beginning of a small meadow. However, Nellie Stevens Hollies can also be planted as stand-alone trees. These trees are dark green, with foliage all year long. In summer, when many other evergreens brown or dry, the Nellie Stevens Holly usually maintains its luscious dark greens. In spring, tiny white flowers float along the tree’s slender branches. The Nellie Stevens Holly is most well-known for its winter colors, where the rich greens are matched with ruby red berries. For this reason, the Nellie Stevens Holly is loved for the splash of color it offers in the depths of the cold season. Sunlight – Plant in a partially sunny area with some access to afternoon shade. Soil – Plant in well-drained, moist soil that is not overly wet. Water – Water every once a week for the first six months, and then during extensive dry spells after that. Nellie Stevens Hollies are generally used by landscapers to create privacy screens. On small to moderate-sized properties, this usually refers to property lines. Nellie Stevens Hollies grow well along these lines, dividing yard from yard with rich, dense green year-round foliage. These Holly shrubs are somewhat drought resistant, meaning the Holly can survive short dry spells. Nor do these shrubs require much, if any, pruning. Nellie Stevens Hollies thrive on neglect. Simply plant the saplings acquired from The Tree Center 5 to 6 feet apart in a single row to develop a dense privacy screen. Explore your property for an area where Nellie Stevens Hollies are needed. 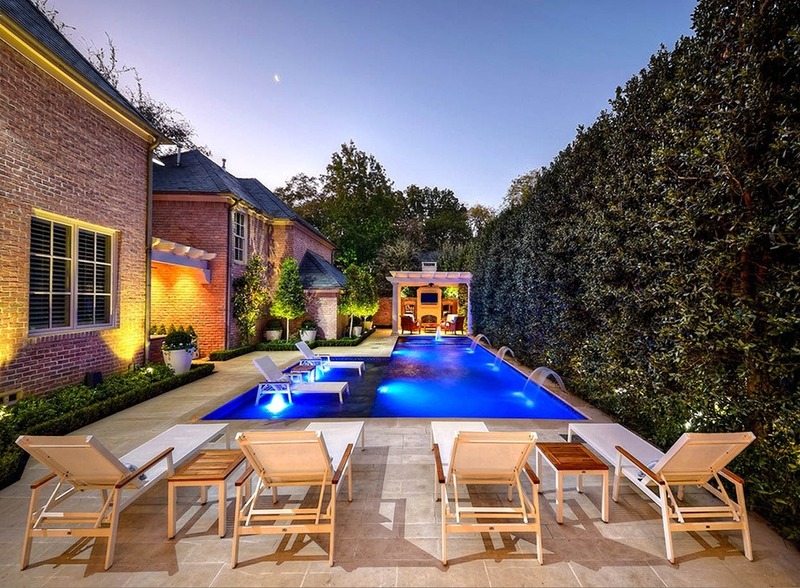 Most folks recognized the need for a privacy screen while lounging on a back porch or in the backyard. Nellie Stevens Hollies also do well as accent foliage in linear gardens, where the vibrant winter red berries can remain prominent. Nellie Stevens Hollies are fast-growing, developing up to 3 feet of new growth a year. Nellie Stevens Hollies are relatively hardy and strong. 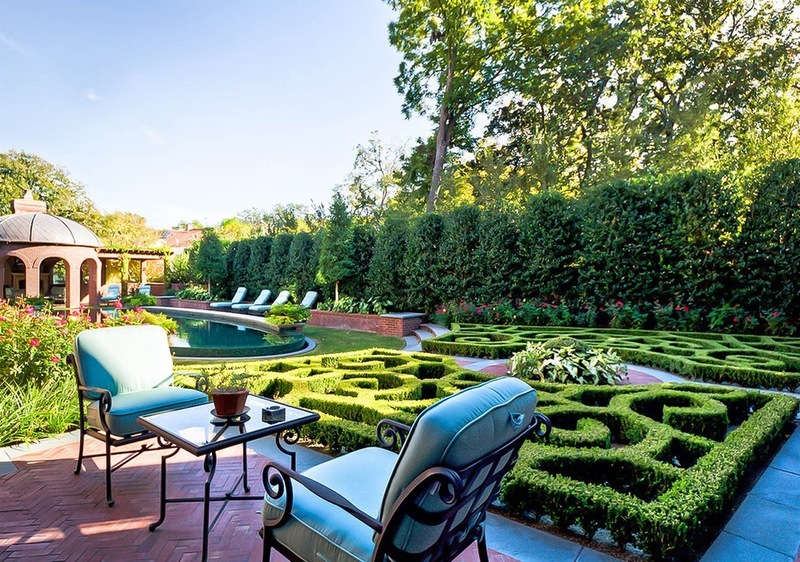 These privacy screen or accent trees require a sunny location with some access to shade. Regular watering is also needed, or the leaves will dry out. Single Nellie Stevens Holly bush. Nellie Stevens Hollies are fast-growing trees, which are frequently planted in rows between 5 and 6 feet apart to create a dense hedge or privacy screen. When planted in this way, Nellie Stevens Hollies typically reach a height between 15 and 25 feet. When planted individually, this Holly Tree is likely to reach even taller heights, between 25 and 35 feet. Regardless of its proximity to others in the species, Nellie Stevens Hollies are considered fast-growing trees, and they can grow as much as 3 feet a year. This is much higher than other trees, which can grow as little as 6 inches in a given growing season. For this reason, Nellie Stevens Hollies are valued as privacy screens, as they can quickly provide the privacy for which homeowners are searching. Nellie Stevens Holly is a hardy tree. 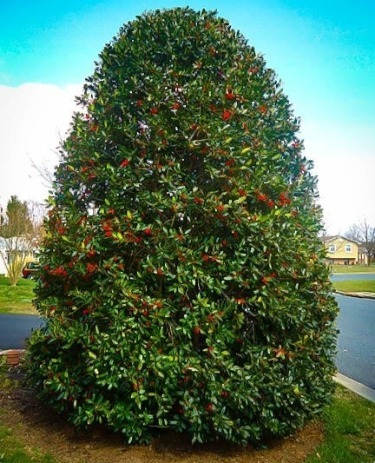 With proper care, these evergreen Holly trees survive well in rural, suburban, or urban areas. Several states list Nellie Stevens Hollies on approved urban planting lists, as this Holly is a fast-growing vegetative screen, which is both drought tolerant and pollutant tolerant. When it comes to caring for your Nellie Stevens Holly, water and sun exposure are the most important considerations. Nellie Stevens Hollies prefer partial shade, with some light morning and early afternoon sun followed by shade from the hottest mid-day and late afternoon rays. These Hollies are one of the few evergreens that will do well with heavy shade, and they are enjoyed for this reason as vegetative screens with already standing trees or plant-life. Water is the other point of focus when planting and caring for the Nellie Stevens Holly. These Hollies grow well in USDA Hardiness Zones 6 through 9, which excludes the far northeast (New York and above), though the east coast up to New Hampshire is still welcoming. It also excludes areas west of Ohio, north of Kansas, and east of western Idaho and Nevada. If planting the Nellie Stevens Holly the drier regions of the southwest or mid-west, consider irrigation systems. Nellies require moderate water amounts, though they can survive mild droughts with relative ease. If droughts or extensive spells of heat are prevalent in your region, simply ensure the tree receives watering at least once a week. Irrigative systems work well as they will typically conserve water while still ensuring the success of the Holly tree. Nellie Stevens Hollies are part of the Ilex genus, a group of between 400 and 600 shrubs and trees. Nellie Stevens Holly is itself a specific hybrid within the family, a cross between a Chinese Holly and English Holly. There are hundreds of other Hollies to choose from within the Aquifoliaceae family; however, none will bring you the specific benefits of the Nellie. If a Nellie Stevens Holly isn’t your cup of tea, the American Holly has been making a resurgence of late and offers similar benefits. Recently planted 23 Nellie Stevens 6-7 feet tall, approximately 5 feet apart on center. What do you recommend for watering? We are in zone 7a. What type irrigation system works best? Water well once a week if you live in a drier areas. killed one of them and I had to cut the others back to almost nothing. They recovered and are not growing. I am thinking about digging them up and putting in something else but hate to do that. I love the shape and hardiness of the Nelly Stevens leaf but it looks like it grows really tall. I want a hedgerow no taller than 4 ft. Can this type of holly thrive when contained to that short height? Or, Is there a holly with that leaf shape and color that would do better? Can these trees be planted right now in june 2016 in zone 9 area which is hot now. We have some mature Nellie Stevens, planted about 4 years ago (6-8 feet tall when planted) and now they are roughly 10-16+ feet tall. Many of the trees have limbs that are lying on the ground, around the base. Is there a reason to trim these back or are the lower branches on the ground perfectly ok? Live in zone 6, planted 4 nshollies in spring of 2015. They don’t seem to have the growth rate as stated per year. One seems extremely stressed and I’ve given extra water due to the extreme heat. Wonder if applying diluted Epsom salt would give this tree a boost? How do you think they’d do if planted along the Indiana/Michigan border? I live in zone 5b, will the Nelly Stevens Holly thrive here? Are the berries poisonous to pets? I have just bought a brick home and I have Holly trees that previous owners planted like bushes along side the house. These are not bushes, but a tyoe of Holly tree. I’ve been trying to find the type of Holly tree it is on the internet. I am pretty sure it is the Nellie Holly tree. There are 4 or 5 planted in a row along the side of the house. I found a stress crack in the basement wall and need to remove these trees. Can you please give me advise. The tree tree is maybe 8″ in diameter. How deep do these roots go. How do I kill the roots after I cut the tree down. I wish I could move them to the property line for privacy. Thanks for all your help. I’m afraid they will cause damage to my house. There is a root killer you can purchase. I have used one for years. Just follow directions on the container. We had heavy rains all Spring, and my NS Hollies were in consistently wet soil for at least four months. Much to my surprise, all three of them did just fine, no sign of damage at all. My backyard is backing a busy street and planted 8 Nellie Stevens holly four years ago. It grew less than a feet in that 4 years time and just now around 3 feet tall. I live in North Texas. Any suggestions? hi, I have 3 ft of space between my pool and ugly fence (wood) where I have 5, once beautiful 20′ tall Italian Cypresses. Unfortunately spider mites got to them and destroyed more than 2/3 of them so they’ve got to go. I am considering planting the Nelly R. Stevens Holly in their place, and pruning them to stay as a tall hedge. Are the roots invasive? will it cause any damage to my pool or the plumbing. can they be pruned to stay about 3ft wide? I live in the DFW area. I need this answer also. I planted three NRStevens close to my pool. Wondering if the roots could become invasive? Did you get an answer to your questions? I’m in dfw too w same questions. Are the Neville Stevens Holly deer resistant? I have been doing a lot of research on these lately. There are deer and other small animal resistant. They are slow to get going but start building speed and probably by their 5-7 year they grow fast. You are almost there! I wouldn’t wish these on my worst enemy. Mine are smaller now than when planted four years ago, and I’ve given them tlc. They are also huge water hogs. I have a Nelly Holly. She is about 25 years old. I have shaped her as a tree. The top is a round ball and I keep her trunks clean. Every spring she drops her leaves and this year she is dropping a lot of red berries. Is something wrong with her. I’ve cleaned up loads of leaves and berries twice. She still looks beautiful. Can you advise me what to do.